I know it has been awhile since my last post. This is what happens when you move. Actually, I moved from one city to another. Aye yai yai! What a confusing and expensive undertaking, but now it is done. I actually moved in August and it has taken me nearly two months to get our new place in order. However, I have taken this time to post the ad below. I know it is late in the evening, but you still have until 11:59 pm tonight to grab some exciting items in Roaman's clearance sale. 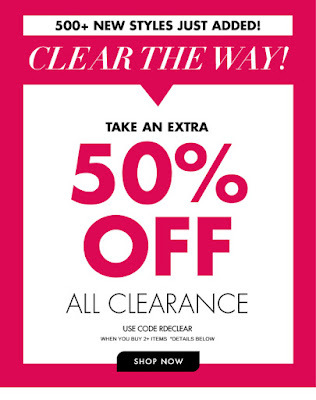 When you do don’t forget to use the promotional code, "RDECLEAR" to gain an extra 50% off on your selections. You can also check out Roaman's Fall selections. Hey! Before you go, check out how Désirée turns an extra long and wildly curly wig into something fashionable and elegant.